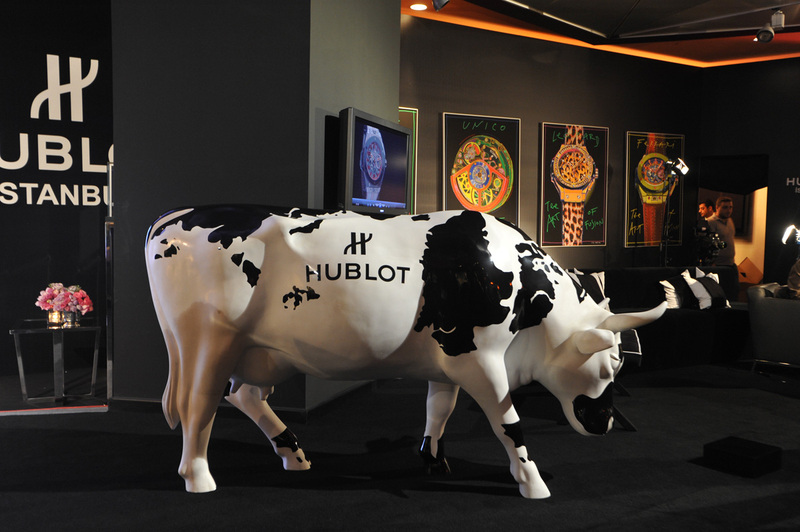 The Pop-Art Holstein cow with the Hublot logo is probably a reference to Jean-Claude Biver, who besides running a luxury watch brand is also producing a very exclusive cheese. The opening by Jean-Claude Biver of the Hublot boutique in the prestigious Istinye Park shopping centre in the Istinye quarter of Istanbul on 5 November 2013 once again highlights the brand’s fantastic expansion across all the major luxury shopping centres around the world. Under the leadership of Jean-Claude Biver, Chairman of Hublot, and Ricardo Guadalupe, the company’s CEO, 66 Hublot Boutiques have been opened since 2007. 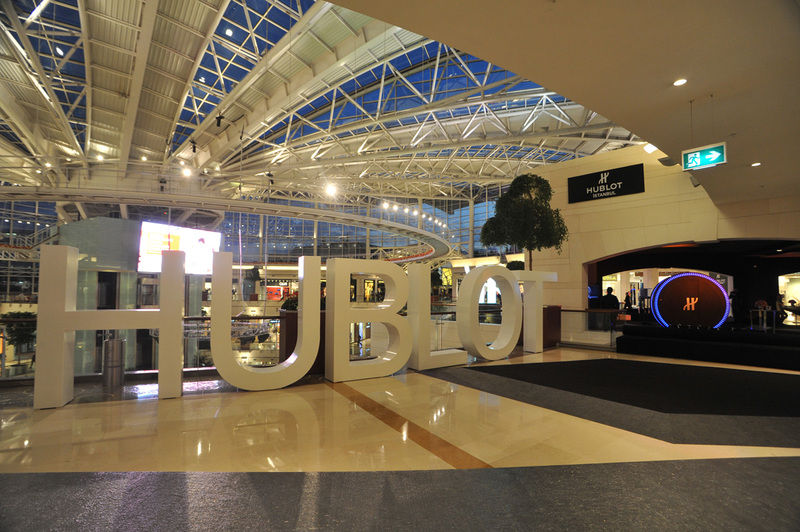 Hublot chose to open its first boutique in Paris – the fashion and luxury goods capital. Further boutiques are set to open in the coming weeks in Houston Texas, Munich in Germany, Lucerne in Switzerland and Santa Fe in Mexico, along with 3 new boutiques in China (in Shenyang, Changchun and Chengdu). This opening in Istanbul heralds the arrival of a new concept in interior design for Hublot boutiques worldwide, a concept which has been developed entirely within the company. With a shop floor covering 50 square metres, the boutique in Istanbul gives a fresh interpretation of the concept of “fusion” so dear to the brand, using a new combination of materials such as silver brushed Oakwood and wool floors, silk-lined panels covering the walls, interwoven with elegant elements made from ebony and chromed steel to accentuate the display cases to great effect. There is a fusion of materials, but also a fusion of styles: in the more private spaces, gilded velvet is combined with a particularly elegant fabric to give a contemporary reinterpretation of XVIth century mouldings. A brand new lighting concept has also been installed for the display cases, using focused beams of light to highlight the watches, movements and precious stones. Together, these naturally create a soft, warm ambience in shades of grey and black, complemented by contemporary furniture, in particular the full grain leather sofas and armchairs which have been handmade in Italy. A range of light fittings including table lamps, wall lights and chandeliers, custom-made in Murano in Italy adds an artistic touch. To accentuate the display cases housing the showpieces, Hublot exclusively commissioned silvered, broad, rounded panes of glass made in Italy. Finally, the brand’s key models have been reinterpreted on Pop Art-style canvases. The innovative and technological touch dear to Hublot is represented in the display cases with the spatial motors, which enable you to view a watch from all angles, and the special LCG glass panes which finely embellish the watch display cases on the walls. At the entrance, to welcome customers and invite them to enter the world of Hublot, a large plasma screen displays images of the brand’s many events and partnerships.